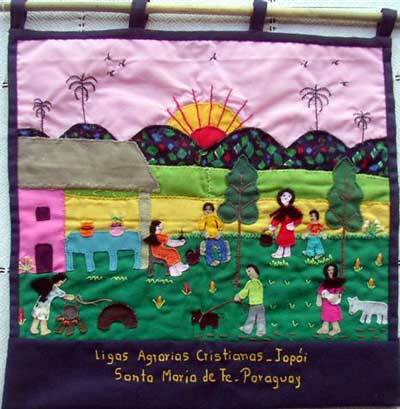 This page tells the story of the creation and the destruction of the Leagues in Paraguay, and how today they are remembered in appliquéd hangings made in Santa María. To go straight to the pictures of the hangings, click here. 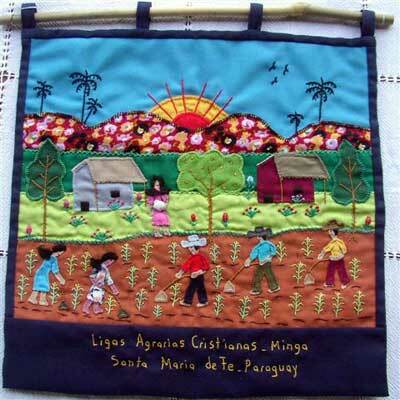 The Ligas Agrarias Cristianas (Christian Agrarian Leagues) were an early form of Christian base community. They began in 1960 among Paraguayan peasants in Misiones, in the south of Paraguay - the Department in which Santa María de Fe is situated. 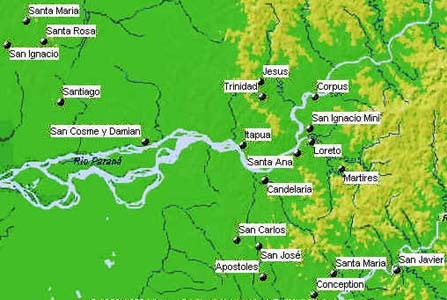 Santa María de Fe was one of these Jesuit Reductions. stills from the film "The Mission"
Like the Reductions 200 years earlier, the Christian Agrarian Leagues were communities for the rural poor, where people worked together and shared the proceeds. Like the Reductions they aroused jealousy and resentment among those who saw them as an economic rival. 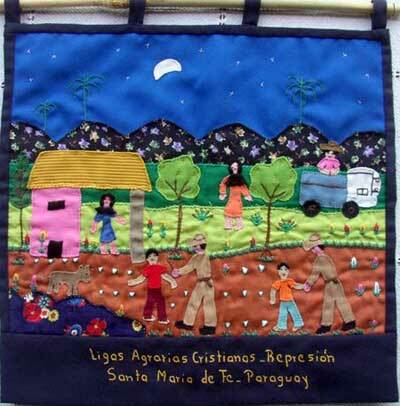 The first Christian Agrarian Leagues began in Santa Rosa, which is the neighbouring town to Santa María, in 1960. Two years later Santa María came into a Regional Federation of the Leagues (Federación Regional de las Ligas Agrarias Cristianas, FERELAC). The Christian base communities which began in Brazil at about the same date suffered persecution but survived to the present day, and are admired all over the world. 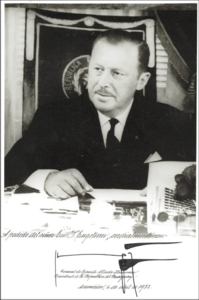 But the Christian Agrarian Leagues of Paraguay were completely wiped out by the dictator Alfredo Stroessner in the year 1976. He accused them of being communist. The worst week of repression was the week before Easter (Holy Week) when the police arrested many community leaders and took them away for torture and months or years of imprisonment. 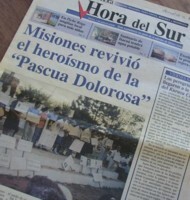 Local people call this the Pascua Dolorosa - the Sorrowful Easter. 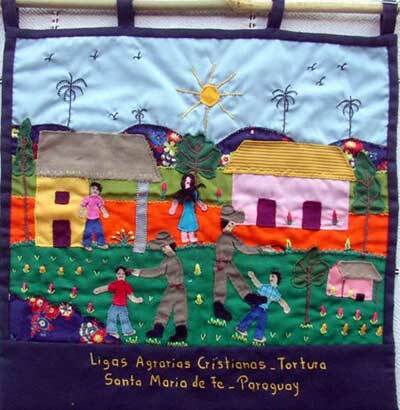 But in 2003, twenty seven years after the repression, the craft workshop of Santa María responded to the request of a historian to tell the story in pictures. 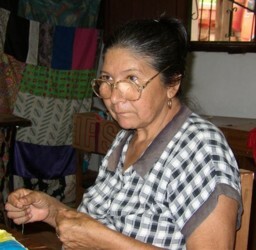 Neni Duarte (pictured below), the wife of one of the imprisoned leaders Eliodoro Coronel, designed and sewed the first scenes, working from the memories deeply engraved in her heart. There is a series of six pictures, embroidered with appliqué, which show the life of the Agrarian Leagues and their cruel repression. The first of the series shows the Minga. This is a Guaraní word for an ancient indigenous custom, by which several men would work in turns in each one’s field, to make the work lighter and quicker and to strengthen friendship. They could also work a field owned in common. The money earned by the minga would be used to buy food in common. 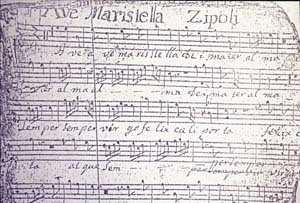 A closely associated concept was Jopói, which meant sharing. A traditional expression of it would be that when one family kills a pig, it shares it with the neighbouring families, and they in turn do the same when they have an animal to eat. The idea of helping neighbours became incorporated in the Leagues, and often Saturday would be set aside for the jopói, much of which was to repair houses. In this hanging we see people coming to cook a common meal: one woman brings a chicken, another brings a cooking pot, and another stokes the fire. A seated couple share the local drink of tereré. Next to the fire we see the traditional open-air brick oven known as the tatakua (fire-hole). 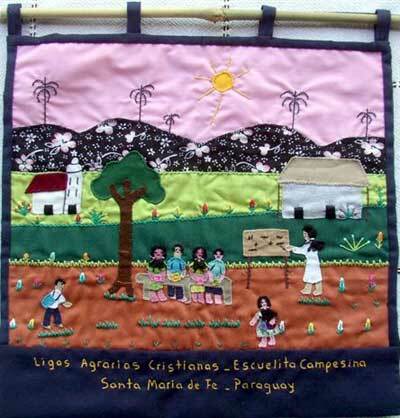 The third hanging shows the peasant schools begun by the Leagues, which were known as Escuelitas Campesinas. They began in 1971 as a response to the needs of children whose families could not afford the cost of books, shoes and uniforms, or who had been labelled as “problem kids” because they were children of League members and put awkward questions to the teachers. The Leagues opened 28 schools, all run by campesino teachers, with an emphasis on valuing their own culture and speaking their own language. Children did not wear uniform but were encouraged to come just as they were, barefoot and with patched clothes, as we see in the picture. All these expressions of community life were rooted in the practice of reading the Bible in groups, and reflecting prayerfully on its message. 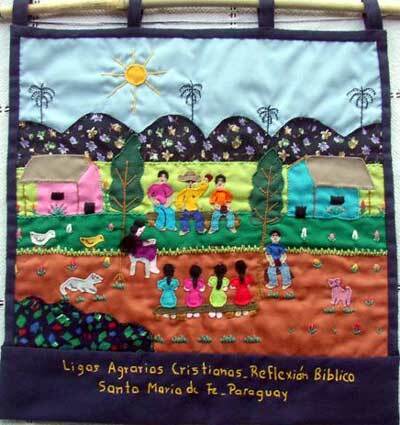 In this hanging of Biblical Reflection we see a group sitting in a circle in the open air, with their Bible in hand. Still today in Santa María, this is how the Christian communities meet once a week. The figure in a yellow shirt with a cross on it is Jesus - barefoot and with a sombrero. The last two pictures show how it all ended tragically. The Repression shows the arrest by night, and we see a jeep coming by the light of the moon to carry off the men from their homes. The women are left helpless, and the dog barks in vain. Finally there is the Torture, when the police kick their prisoners on the ground and hit them with an instrument of torture which had three rubber thongs tipped with metal. or they can be done as a large composite piece, two pictures wide and three high: the price is the same. Each one of the six panels is approximately 38 x 40cm. If they are sewn together to make a composite piece the result is approximately 78cm wide and 120 high. There is always a little variation as every piece is an individual creation, but if it is for a particular space we may be able to make it to measure for you. Please remember that because each piece is an individual work of art, details may vary, and if separate pictures are ordered at different times they may not exactly match in size and in the colour of the framing material.